The jet-lag has almost worn off, but we are back home in Squamish after spending 10 days on Canada's beautiful East Coast. We literally travelled across the entire country! The only way it could've been further is if we lived in Tofino, BC (instead of Squamish) and were travelling to St John's, Newfoundland (instead of Corner Brook, NL). But it was all worth it to see my beautiful, wonderful, amazing best friend marry her soul-mate! I was so blessed to be the Matron of Honour at their wedding (I still prefer Maid but the blingy on my fingy dictates otherwise! ), and it was a wonderful day. I pretty much cried at everything - I blame it on the pregnancy hormones. But it really, truly was a great day. The ceremony was held at a church in Corner Brook NL, and it was the same church the groom's parents were married in over 30 years ago. The Reverend was absolutely hilarious and had all of us in stitches throughout the entire wedding - including the rehearsal (which I also cried at, I'm such a loser). The reception was held on the shores of nearby Deer Lake and although it clouded over the rain held off until very late. Even then it was just a little sprinkle - no biggie. It started clouding over earlier in the afternoon and I expressed concern that it might rain when one of the other girls said, "Oh don't worry, the groom's mom hung a broom upside down from a tree - it won't rain today". Old Newfie wives tale I guess... but it worked! I might have to try it next time I need the rain to hold off during an event. I used Simplicity 2250 which is the ubiquitous Cynthia Rowley pattern that everyone and their dog has made up at some point. 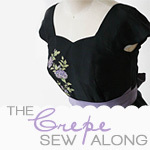 Originally I had planned to make the Love In The Afternoon dress from Twinkle Sews. Buuuuut after printing out a size 4 (based on my normal bust size) and making up a wearable muslin, I realized that my sweater-puppies have grown too much due to le bebe and there's no way I can fit the dress until next summer (at least). I really liked the special touches on the Twinkle by Wenlan dress, so I copied the embroidery technique on the straps of the Cynthia Rowley dress. I meant to add yellow buttons to the straps on the back of the dress and to gather the bustline a bit more (as specified in the pattern) but literally ran out of time. I made the best man's tie out of the same fabric as my dress and had to hand-sew the whole bloody thing. Took for.ev.er. I hates hand-sewing! The tie is from an old 70's pattern I bought at the thrift store in Salmon Arm for $0.10. Worked a treat! I leave you now with the happy couple's official wedding song by the Dave Matthews Band. Enjoy!